British pianist and composer Adam Hutchins has enjoyed 20 years of music making in the beautiful High Peak close to the city of Manchester. Equally at home in jazz, popular and contemporary music, he has refined both piano and writing skills across years of live gigs and session work. Adam maintains a busy freelance career with bands including “Quintessential Swing”, “The Rumour Mill” & “The Mike James Orchestra”. He composes & produces new music at www.highpeakmusic.com and is also Musical Director of the historic New Mills Brass Band (1812) www.newmillsband.com where he conducts & teaches brass instruments. Concert appearances have included work with international singers such as Merill Osmond & Daniel Koek (Les Miserables) and a 2018 tour of Russia with “The Mike James Orchestra”. 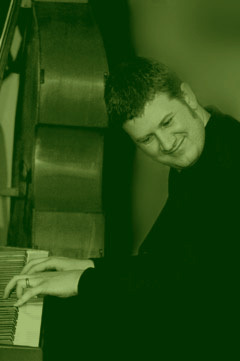 Adam has also worked as Musical Director & Pianist with UK singers such as Loretta Scott, Debbie Wilson, Lyn O’Hara & Zoe Kyoti, plus session work with “The Rat Pack Vegas Spectacular”, “Dominic Halpin & The Honey Bs”, “Swingmania Big Band”, violinist Craig Owen and “Almost Ella” featuring Danish singer Brigitte Escobar. Adam also organises bands for weddings and corporate entertainment at www.swingbands.co.uk. He is available for gigs, musical directing, composing/producing/arranging & teaching of piano, keyboard & brass. He has wide experience working in most popular settings and can advise on technique, repertoire and interpretation as required. From small combos to professional theatre shows, Adam is equally at home both improvising and reading music. Adam’s festival performances have so far included Buxton Fringe, Newark Jazz and Nantwich Jazz & Blues; concert highlights: Ronnie Scott’s with Millennium Jazz Orchestra, Liverpool Philharmonic Hall with Swingmania & Old Trafford FC for the UEFA cup final VIP entertainment. For all enquiries please phone 07957 288 550 or use the Contact page. This entry was posted on Wednesday, September 17th, 2008 at 3:52 pm	and is filed under homepage. You can follow any responses to this entry through the RSS 2.0 feed. Both comments and pings are currently closed. ©2006-08, Adam Hutchins Ltd. Registered Company No.5823534. All Rights Reserved. Registered Office: Brick House, 150A Station Road, Woburn Sands, Milton Keynes, MK17 8SG.